August 24, 2012 – Bil-Jac Foods of Medinia Ohio has announced a product withdrawal of a limited number of one of its dry kibbles due to possible contamination with mold. 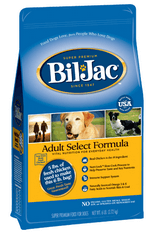 According to a company spokesperson, the withdrawal includes only the 6 pound package of its Bil-Jac Adult Select Formula dry dog food with a lot code of 1792-02 and a Best By date of 27 December 2013. Be sure to save a link to this page as additional information will be posted here as soon as it is published. Or simply follow Dog Food Advisor on Twitter.